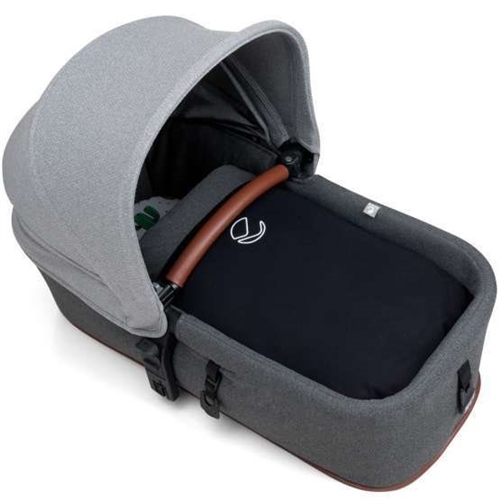 The Micro carrycot from Jané provides a practical and light weight option for transporting your baby while he rests. Thanks to the Pro-Fix system it can be fitted onto most of the chassis of the current Jané collections, as well as all the other Pro chassis and pushchairs of previous years. The easy folding and unfolding system using fastening straps means it folds up very flat taking up the minimum of space in the car and at home. The quick and simple way it unfolds makes it very useful in situations that require a simple and safe response. The attractive design is based on a top quality anodised aluminium structure giving it great stability. The rigid one-piece base lets the baby rest in complete comfort, while the hood can be folded with the structure, making it all very compact. Pro-fix system – the carrycot is compatible with all Jané Pro chassis and pushchairs (best suited to: Jané Rider, Jané Trider, Muum). No Need to use or buy extra awkward fitting kits. As a foster carer I have owned many prams but this is by far one of the best. I already had the Jané crosswalk pushchair so wanted a carrycot to fit on the wheels. This fits to the wheels easily and quickly and can be removed just as easily - was particularly impressed with the extra tabs that click to the chassis for safety. The design is beautiful, particularly the lining and looks so smart to push around, the mattress is very thick and to baby is obviously very comfortable when in it and sleeps well. I would 100% recommend it to anyone!